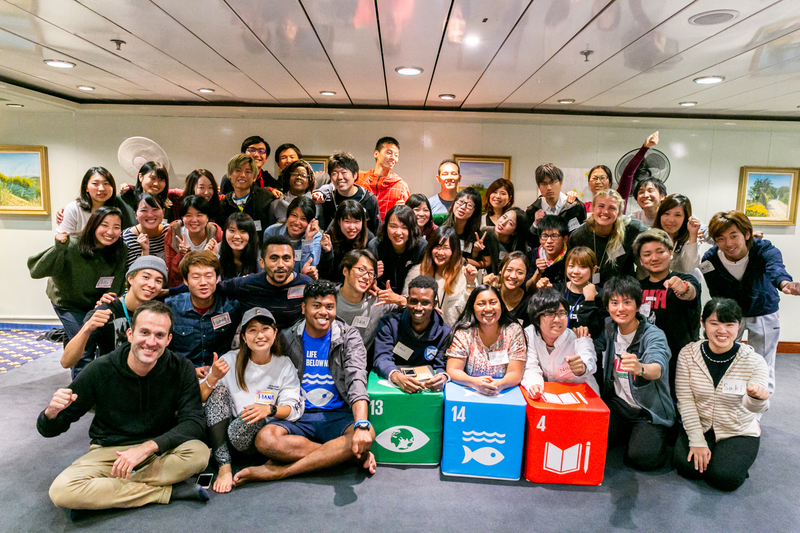 From June 25 to July 13, Peace Boat organized the second edition of the Ocean and Climate Youth Ambassador Programme. With this programme, Peace Boat brings young people from the Pacific Ocean, Indian Ocean, and the Caribbean to travel onboard its ship to engage in capacity training and raise awareness about the impact of ocean degradation and climate change issues affecting their regions, spreading their messages to civil society organizations and governments across the world. 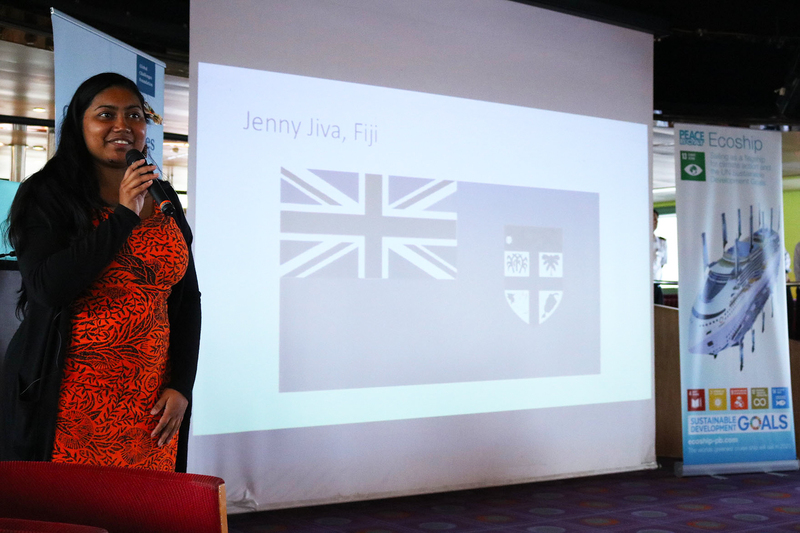 After the successful launch of the Ocean and Climate Youth Ambassador Programme on the 95th Global Voyage, an Endorsed Event of the Fijian COP23 Presidency, Peace Boat hosted seven new ambassadors on the 98th Voyage, hailing from the nations of Palau, Fiji, Timor-Leste, Mauritius, Singapore, Seychelles, and Barbados. After boarding in Stockholm, Sweden, they traveled through the ports of Copenhagen, Denmark; Bergen, Norway; Reykjavik, Iceland; and Halifax, Canada; before reaching their final destination of New York, United States. 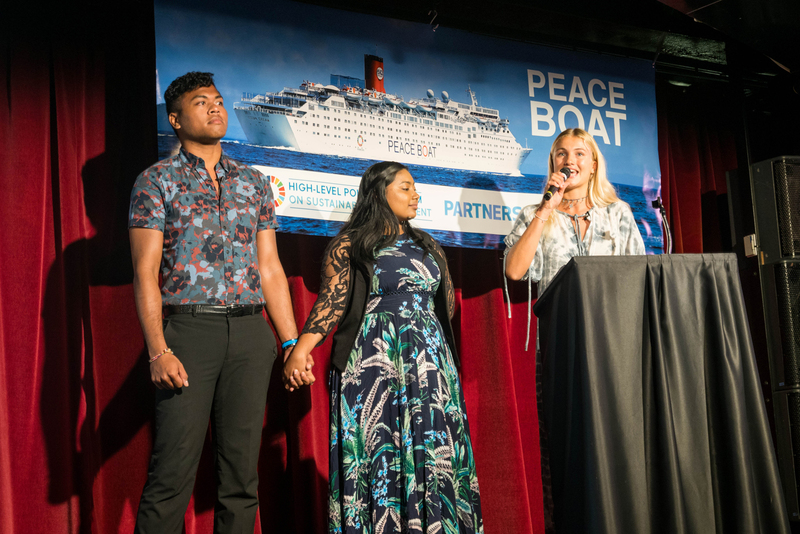 Though the seven Ocean and Climate Youth Ambassadors remained onboard for a relatively short portion of Peace Boat’s 98th Global Voyage, they made quite an impact while they were on the ship. The group kept busy with discussions and lectures on climate change, attending social and artistic events, and of course, getting to know each other better through their shared commitment to fighting for a safer and more sustainable future for their countries and the world. During the programme, a range of guest educators joined the group onboard. Among them was Adriana Valenzuela, Focal Point for Education and Youth at the United Nations Climate Change Conference (UNFCCC). In addition to engaging in serious discussions about ocean and climate change, the ambassadors also presented the cultural heritage of their home countries and communities to highlight the value of what is at risk. The programme began while the ship was still docked in Stockholm, with an onboard event, “Ocean Degradation and Climate Change: Perspectives from the Global to the Local” which was hosted jointly by the Global Challenges Foundation, an organization founded in 2012 by Swedish financial analyst and author Laszlo Szombatfalvy, with the aim of addressing the main global problems and risks that threaten humanity. After the ambassadors introduced themselves, examples of the impact of climate change and ocean degradation in their communities and possible solutions, some of them participated in panel a discussion together with Merci Olsson of Race for the Baltic and Patricia Villarubia Gómez, a Marine Pollution Expert at Stockholm Resilience Center for Project SeaBOS project. The panel was moderated by Jens Orback, a Swedish Social Democratic politician who was Minister for Democracy, Metropolitan Affairs, Integration, and Gender Equality in the Ministry of Justice in the Cabinet of Göran Persson (2004-2006). 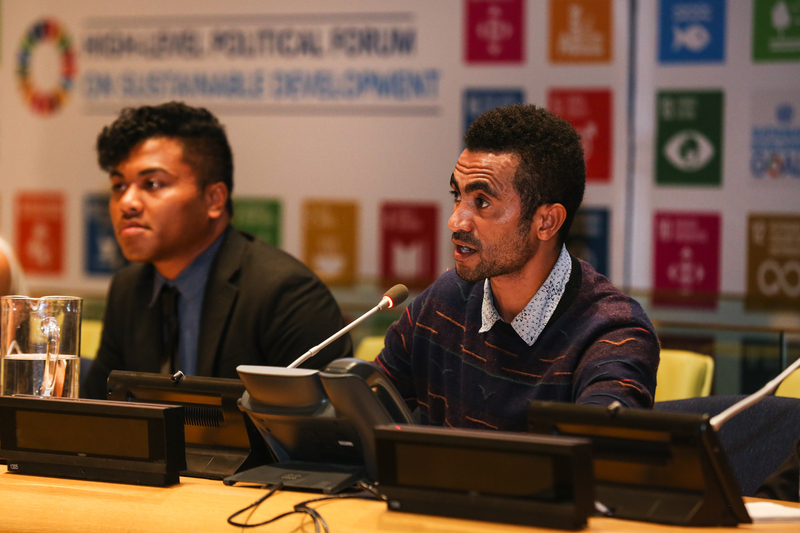 During the event, Genevive Jiva, from Fiji, introduced the Pacific concept of Talanoa, a process of inclusive, participatory and transparent dialogue. The purpose of Talanoa is to share stories and build empathy in order to make wise decisions that are for the collective good and how it was being used by the COP23 to move the climate negotiations forward. The seven youth leaders engaged in Talanoa with local participants to tell stories from their own communities and learn about different problems than Sweden is facing and solutions connected to climate change and ocean degradation. In Copenhagen, Denmark, organized in collaboration with DNV-GL which is working with Peace Boat on Ecoship and the promotion of the SDGs, the group visited a private company called Sustainia, a sustainability advisory group and digital studio working to turn the Global Goals into urgent solutions. After learning about solutions to SDG 13 and 14 in the private sector, they visited the House of Green, a space created by the Danish government to be a platform to showcase green Danish technologies and Denmark’s road to a green transition to learning more about the role of national government. 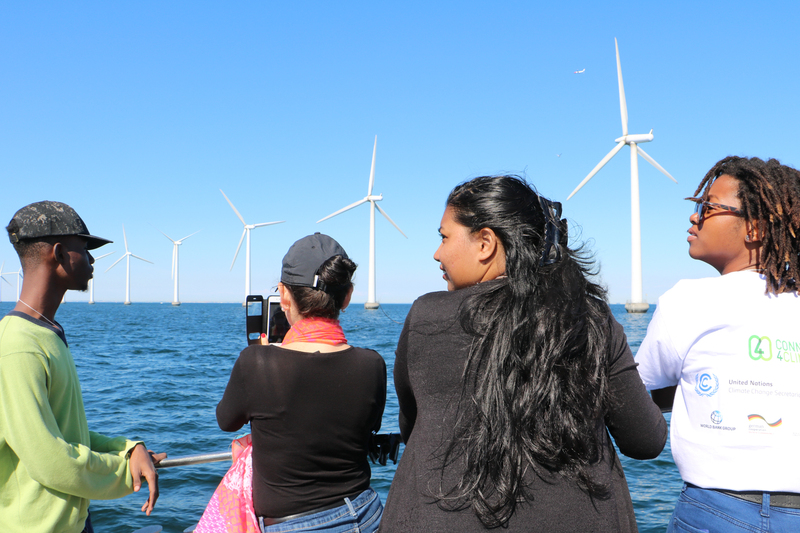 After these two visits, the Ocean and Climate Youth Ambassadors got the opportunity to visit the iconic offshore wind farm, Middelgrunden, established by a cooperative in 2000. They took a small boat from the port to visit one of the huge wind turbines at sea which stand as a symbol of Denmark’s energy transition to carbon neutrality. It was an opportunity to learn about the potential of renewable energy to mitigate climate change and ocean degradation. In Bergen, Norway, Peace Boat co-organized a public event with the United Nations Association of Norway at the University of Bergen. Manzel Ngirmeriil, from Palau, introduced the Palau Pledge and Frances Benstrong, from Seychelles, spoke about the Blue Economy. Other panelists were Frode Eriksen, Regional Business Development Manager, DNV-GL, Miriam Ladstein, Bergen Pacific Studies Research Group, University of Bergen, Adriana Valenzuela, Focal Point for Youth and Education, UNFCCC. Youth from Bergen were represented by Sofia Weimarck Froudakis, leader of Nature and Youth and Julie Sætre of the UNA Youth Panel. During the event, the musicians from Small Island Big Song, traveling onboard Peace Boat from Copenhagen to Reykjavik, joined them and perform different songs. This project, led by Australian music producer and filmmaker Tim Cole and the Taiwanese travel-blogger Bao Bao Chen, is a collaborative music endeavor aimed at uniting musicians throughout the Pacific and Indian Oceans through a love of the sea, islands, and traditional cultures. After the public event, the group visited an exhibition about a plastic whale in the University Museum of Bergen to learn about how the death of a whale off the coast of Bergen in 2017 changed the discourse locally about marine plastic pollution. This exhibition shows the plastic found in the whale stomach and parts of the skeleton and presents the latest in research on plastic pollution. In Reykjavik, Iceland, Peace Boat co-organized another event with the Icelandic author and environmentalist Andri Snaer Magnusson. They were joined by local environmentalists and activists including from Landvernd, a leading nature conservation and environmental NGO in Iceland and Young Environmentalists of Iceland. 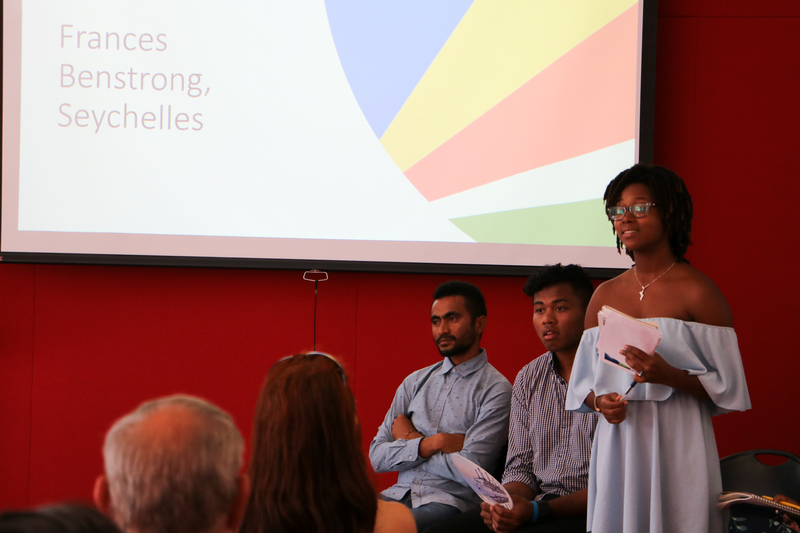 It was again, an opportunity for the Ocean and Climate Youth Ambassadors to share their experiences at the same time they learned from different local activists and build networks. Members of the SDG Youth Council and Young Environmentalists in Iceland told the group about the great work that is done in the country to keep the youth environmentally aware. Later, they visited the Perlan Museum, one of the largest and most ambitious exhibition projects in Reykjavík in recent years. 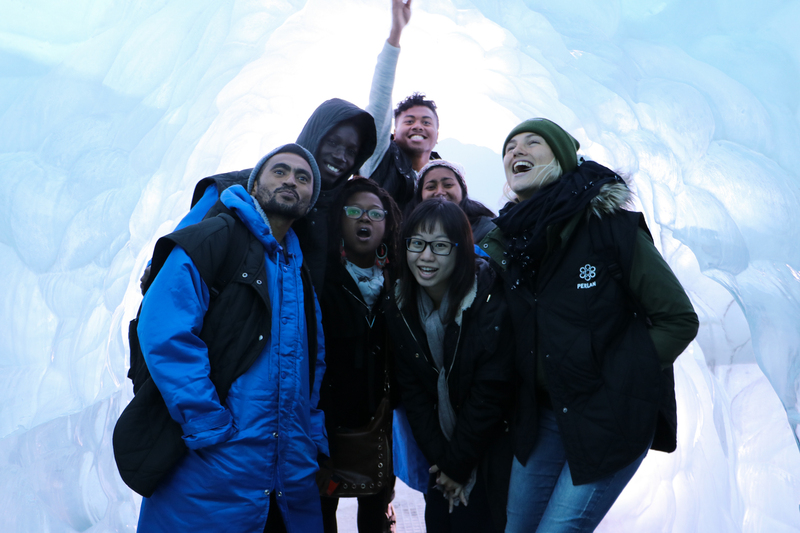 This visit was an opportunity to learn about tools for public awareness raising as they saw how the museum is working to engage the general public and educate about the effects of global warming from an Iceland perspective with interactive exhibits on glaciers. After visiting the museum, they traveled to the geothermal area of Krysuvik to learn about Iceland’s natural energy resources. The last stop before the final destination was Halifax, in Canada. First, the youth group had a meeting with representatives of the Halifax Regional Municipality (HRM) Energy & Environment and Regional Planning Policy (Diversity & Inclusion). Climate Change Specialist, Alex Macdonald, spoke at HRM’s efforts in climate change mitigation and adaptation and the participants in the meeting engaged in a lively discussion about transiting away from fossil fuels and green tech to youth education. This closed forum was followed by a public event at the Halifax’s Public Library co-organized with Greenpeace Halifax. It was attended by local people of different backgrounds and ages who were interested in learning more about the situations on the islands the youth were from. Again, the youth ambassadors used the Talanoa dialogue to engage with the audience, share their stories and learn about the local situation. Peace Boat’s 98th Global Voyage docked at the port of New York City on the morning of July 12, coinciding with the United Nations High-level Political Forum on Sustainable Development (HLPF). That evening, the ship hosted a special side event as part of the HLPF, the inaugural Partnership Expo. The event was co-organized by the UN Department of Economic and Social Affairs (DESA), the UN Alliance of Civilizations (UNAOC), the UN Office for Partnerships (UNOP) and the UN Global Compact. The event featured keynote speaks from high-level representatives of the United Nations including ECOSOC President H.E. Ms. Marie Chatadova, and Ms. Alison Smale, the Under-Secretary-General for Global Communication who attended on behalf of UN Secretary-General Mr. Antonio Guterres. High Representative for UNAOC H.E. Mr. Nassir Abdulaziz Al-Nasser, Executive Director of UNOP Mr. Robert Skinner, and Mr. Dan Thomas on behalf of the UN Global Compact. The Ocean and Climate Youth Ambassadors spoke about their time on Peace Boat in a special section dedicated to Ocean protection together with UNSG’s Special Envoy for the Ocean, H.E. Mr. Peter Thomson and a video message from Sylvia Earle. On Friday 13, the youth had the chance to visit the Ocean Action Hub headquarters and learned about their global ocean action campaigns spearheaded by the UNDP and meet with a group of UN Youth Delegates from Europe to talk about how to tackle climate change in their different countries and youth engagement in the UN process. 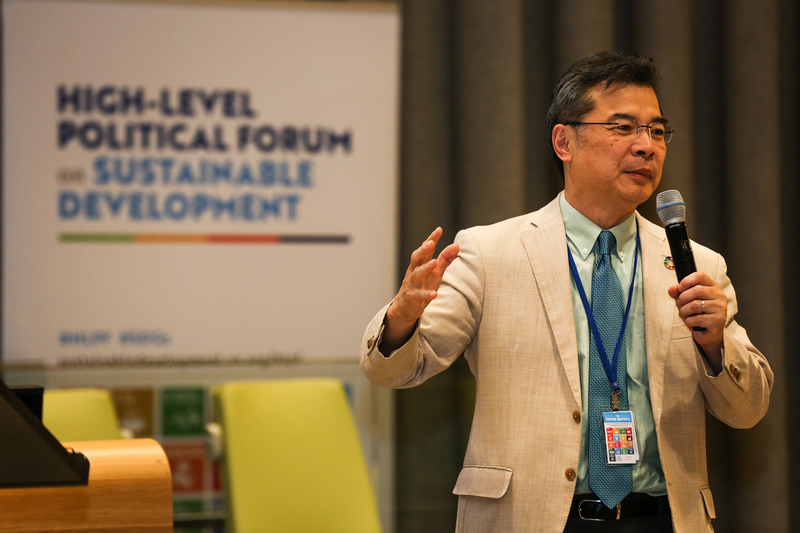 On the sidelines of HLPF, the Permanent Mission of Palau to the UN and Peace Boat organized a side event titled, ‘Global Partnerships for Education, Youth Engagement, and Sustainable Tourism’. 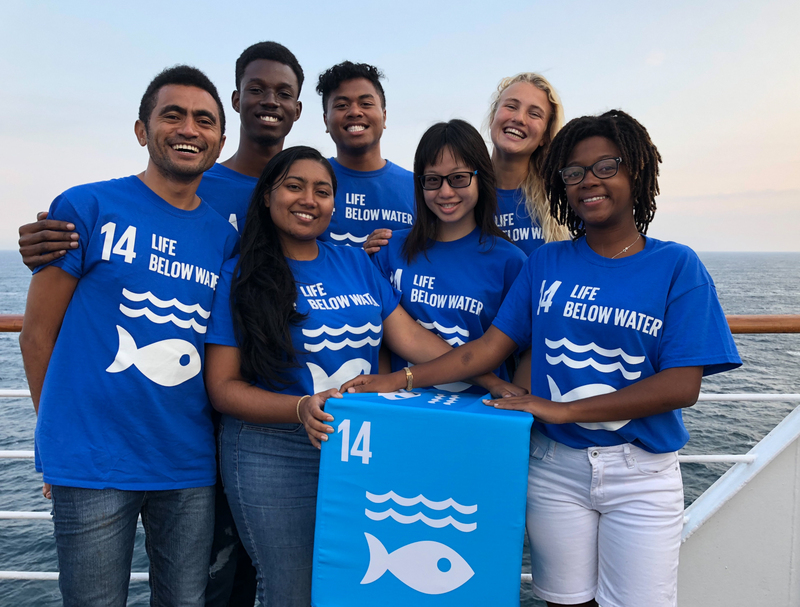 It enabled the sharing of experiences from Peace Boat’s Ocean and Climate Youth Ambassadors Programme, which was announced at the Ocean Conference in June 2017 as a voluntary commitment towards the implementation of SDG 14 (life below water). The Youth Ambassadors took center stage and this was the opportunity for the youth to contribute their voices to and UN community. The side event was opened by H.E. Ms. Ngedikes Olai Uludong, Permanent Representative of Palau. Guest speakers were H.E. Dr. Satyendra Prasad, Permanent Representative of Fiji, H.E. Mr. Ronald Jean Jumeau, Permanent Representative of Seychelles, H.E. Ms. Pennelope Beckles, Permanent Representative of Trinidad & Tobago who praised the youth ambassadors for their passion, dedication, and hard work. Laura Hildebrandt of SDG Action Campaign spoke about youth engagement together with Peace Boat Director Yoshioka Tatsuya. 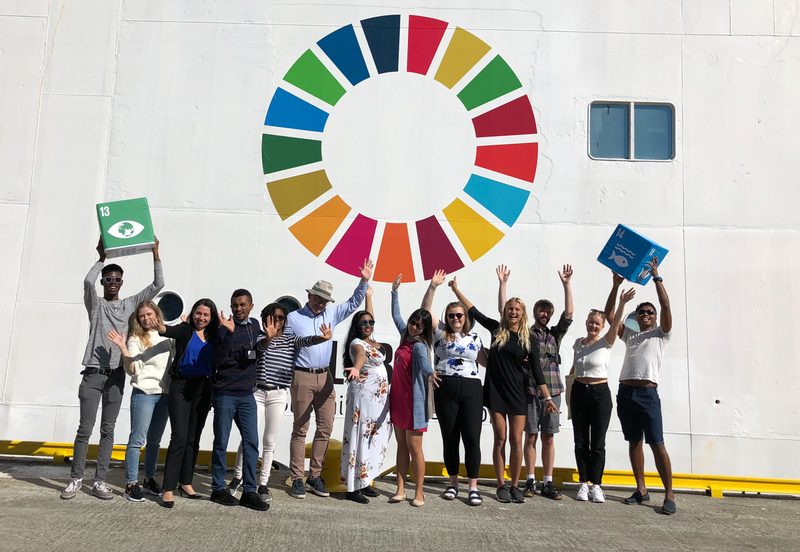 The event was the culmination and highlight of the voyage for the youth and the opportunity for them to share the knowledge and experiences gained and call for action for climate and ocean.